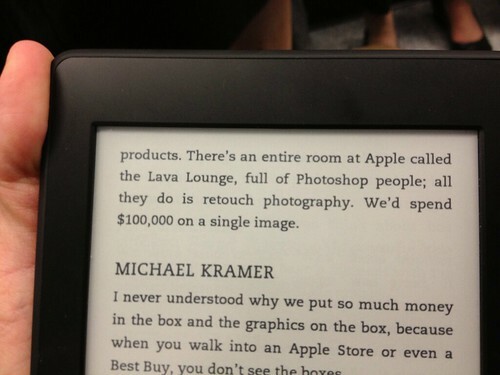 I've decided to do Michael Bierut's 100 days project. I've always wanted to try it and last week I saw Michael talk about some of the little graphic illustrations he's done for the NYT and I wished I had done more work like that. Simple, quick, throwaway. So that's what I'll do for my 100 days. I'll imagine my life is a NYT Op Ed and every day I'll do a little graphic illustration. I've done a Flickr 365 and been playing with 1 Second Everyday so I reckon I'm up to the frequency. Michael has written about the project here. Here's the brief. Do a design operation that you are capable of repeating every day. Do it every day between today and up to and including the last day of the project, by which time you will have done the operation one hundred times. That afternoon, each student will have up to 15 minutes to present his or her one-hundred part project to the class. The only restrictions on the operation you choose is that it must be repeated in some form every day, and that every iteration must be documented for eventual presentation. The medium is open, as is the final form of the presentation on the 100th day. I'm looking forward to seeing how the project changes and letting little rules emerge throughout the 100 days to help me get through. But here are my thoughts as I start. 1. I don't really need any more design work so I'll make these as quickly as possible. They'll mostly be sketches in a notebook I imagine. I'm not worrying about production quality. 2. They'll involve type. For now. But they won't all be word puns. No-one needs more of those. 3. I'm tempted to only use Knockout, it's a beautiful family and has loads of flexibility. But that contradicts number 1. We'll see. 4. I'll do a blog update roughly every 10 days. 5. Seeing as I'm not in a class I might try and engineer some presentation on the 100th day. If you think I can do 100 brilliant graphic illustrations in 100 days based on a life that involves going to an office for 71 of those days you're insane. But I'm hoping I'll get one or two good ones. Maybe towards the end. I started on Saturday so my 100 finishes on 6 January. 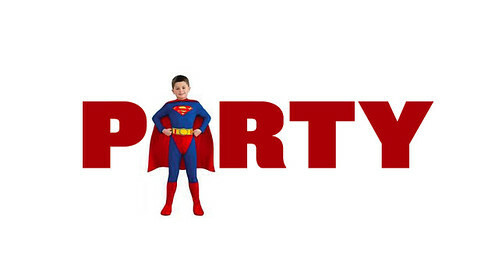 On Saturday we went to a children's Superheroes party. 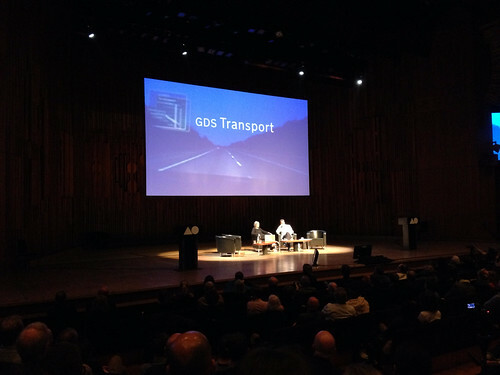 On Thursday and Friday I went to the AGI Open at the Barbican with some of the design team. It was a fantastic two days. It was very graphic designy – it didn't pretend to be anything else. 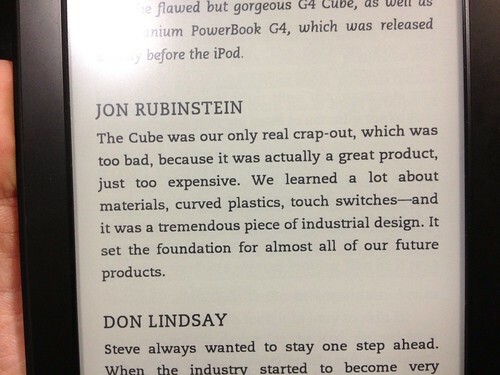 It wasn't about the The Future Of or The Designer As and it was all the better for that. The organisers wisely kept the slots varied; a mixture of interviews, group panels, short 20 minute talks and big keynotes. That worked well. There were lots of chances to mingle and meet other people, speakers and 'famous names' were visible and approachable. I saw a group of 5 young designers (students?) grab Michael Bierut in a doorway and he chatted to them, animatedly, for at least 15 minutes. Kenya Hara was a highlight for me, I was familiar with the work but not the man. He came across as humble, thoughtful and brilliant. His House Vision Expo gave me ideas for the London Design Festival. The Roundheads vs Cavaliers debate was a bit silly but Sagmeister and Marian Bantjes hijacked it in a brilliant way, screengrabing all the minimalists' websites and redesigning them. Alt Group even accepted their proposal and changed their homepage overnight. Fun. Poyner interviewing Saville was a huge missed opportunity in my opinion. Saville is a fascinating character with an amazing body of work, but neither was given a chance to shine. He touched on ineresting topics, being open about being motivated by money for example, but Poyner swung the interview back to, well back to Poyner. Frustrating. Patrick Burgoyne did a good job of holding together the second morning. Jan Wilker & Hjalti Karlsson from Karlssonwilker did a Mr & Mrs style quiz over Skype, which worked surprisingly well. 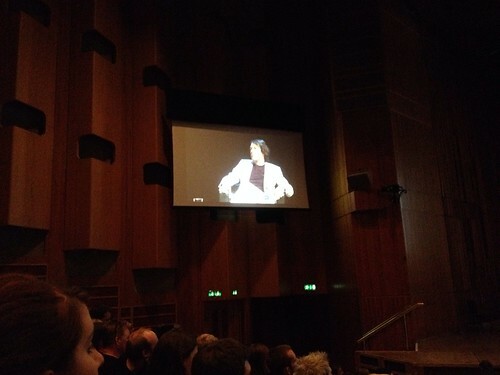 Patrick also interviewed Margaret Calvert which was a rare treat as she doesn't often appear at these sort of things. She was a huge hit with the crowd and was nice enough to mention GDS (even if she did forget my name!). 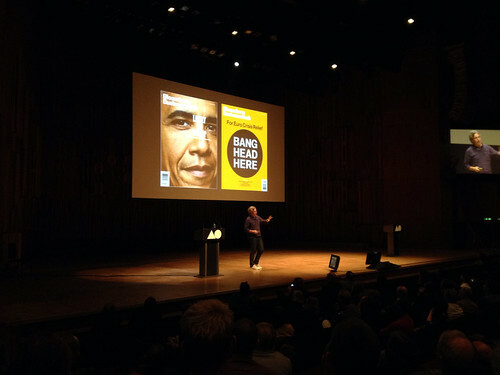 Christoph Niemann gave a fantasic talk. Hilarious, insightful and moving. His video about Maurice Sendak had most of the audience in tears. 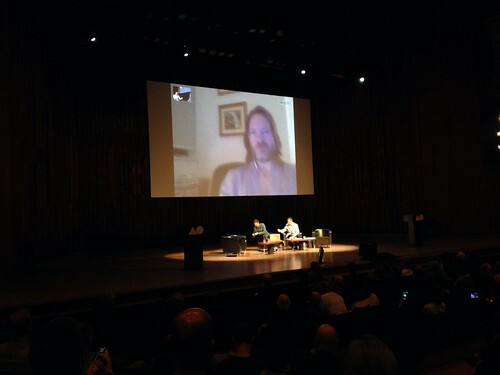 It's not an easy feat to keep a conference audience of nearly 2,000 people enthralled by a video for 5 minutes. Stop what you're doing and watch this, it's an incredible piece of work. Jeremy Leslie was probably the best of the "collections" section. Here he is praising Richard Turley's Bloomberg BusinessWeek covers. Last up was Stefan Sagmeister. 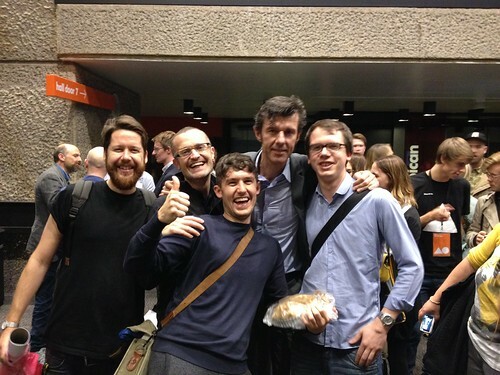 I'm not a Sagmeister fan but his closing keynote was amazing. 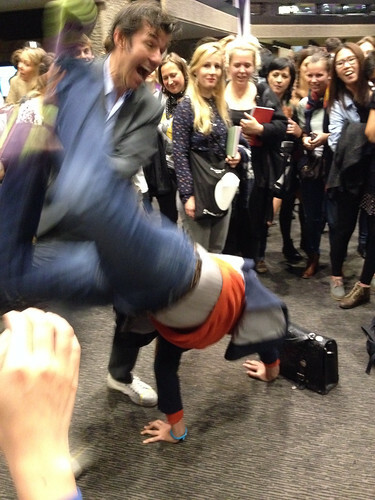 He brought the house down and finished the event off in style. 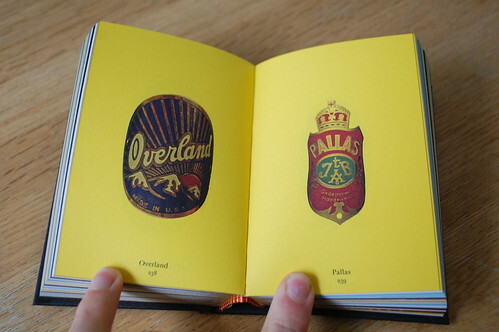 His animated typography in particular was stunningly beautiful. He had people roaring with laughter and at one point stood on their feet singing and then watching in stunned silence as he played stunning typography video after stunning typography video. This kind of stuff. 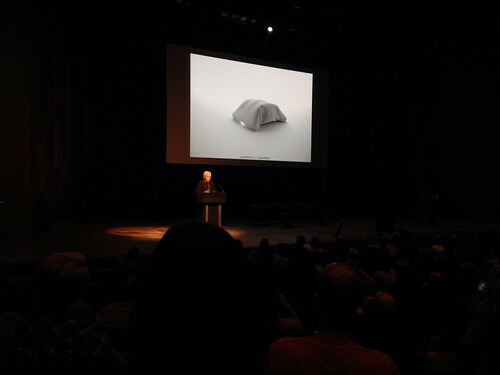 His talk was clever, polished and entertaining. A perfect ending. AGI is a slightly odd organisation to understand but Eye Magazine do a great job here. As crazy as it sounds I would consider going to the Sao Paulo event next year. Oh, and we had our picture taken with the Sag. There are lots of terrible adverts and in some ways it's unfair to pick on just one. But this highlights a common example of bad advertising - things only marketing people say. Watch the first 11 seconds of this. "Look at the state of your clothes! Go and get some detergent and clean them up, and don't forget the softener." No dad has ever said that to their son - ever. No real person has ever said that to another real person - ever. 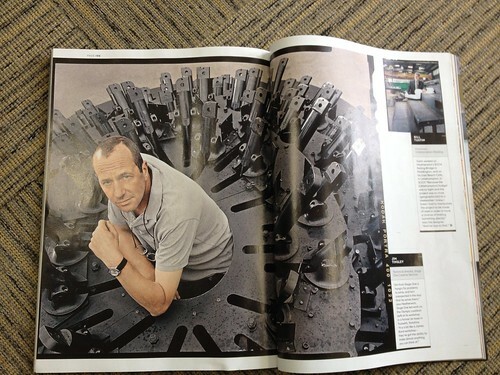 I used to work with a copywriter who would say to me, 'read that out loud, would your Dad say that in real life?'. This would fail that test. 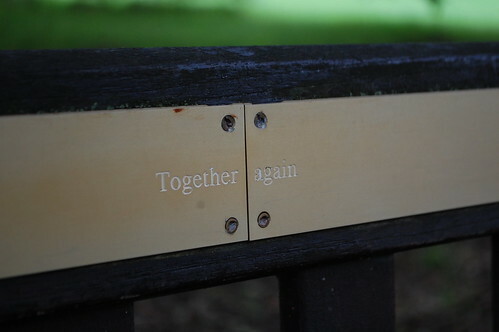 Lovely dedication bench spotted in a park the other day. 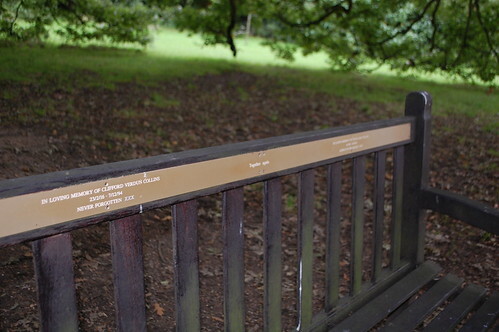 Two plaques for a husband and wife, side by side on the same bench. With this in the middle where they meet. What do you think of the London Design Festival? 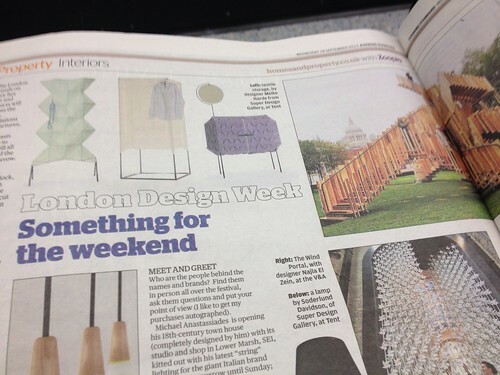 Earlier in the year Sir John Sorrell asked me to be on the Advisory Board of the London Design Festival. To be honest I've not paid that much attention to the Festival before and I'm going to use this as my main advantage - looking at the Festival with fresh eyes. I haven't had anything to do with the current festival, my first Advisors meeting is in October. And so I'd like your help. What do you think of the festival? Please comment below. I know no-one leaves comments anymore but please make an exception in this case. My London's Kerning poster arrived last week. 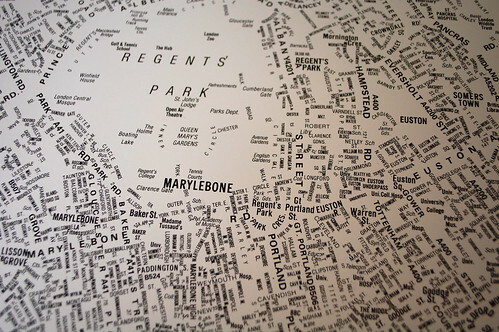 Really simple idea - a big A-Z of London with all the lines taken out leaving only the words. 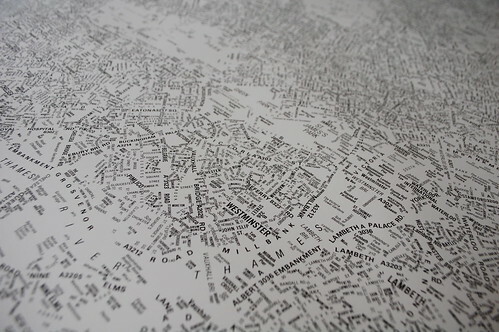 A typographic map of London. All the main rivers and parks remain as empty wordless shapes. You can clearly identify the shape of London. Made by NB Studios a few years ago I've always loved it. It's been out of stock for a long time, but they just re-released it. Buy one here. 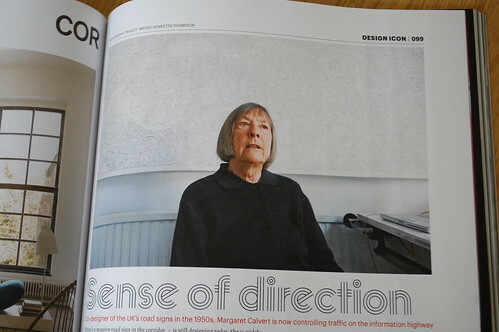 Even Margaret Calvert has one in her studio. 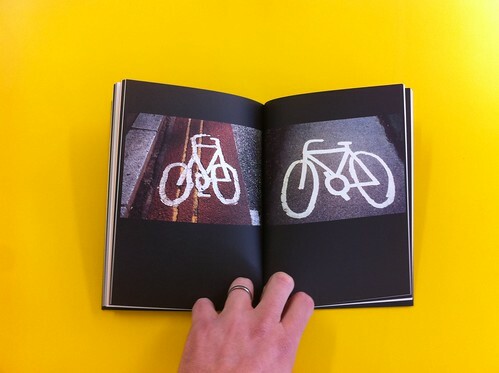 Phil Carter very kindly sent me a copy of his new book, A Cycling Lexicon. 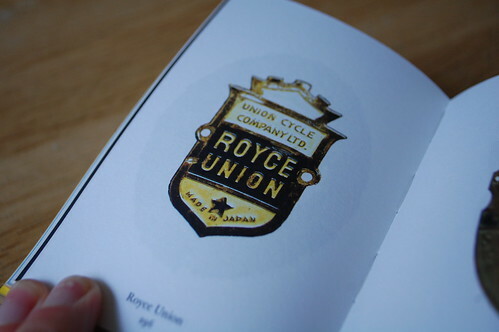 It's a beautiful collection of head-badges – the ‘shield’ on the stem, photographed one to a page. More here and you can buy it here. Goes well with his other book 1037. I'm fortunate to work with talented designers who can write. 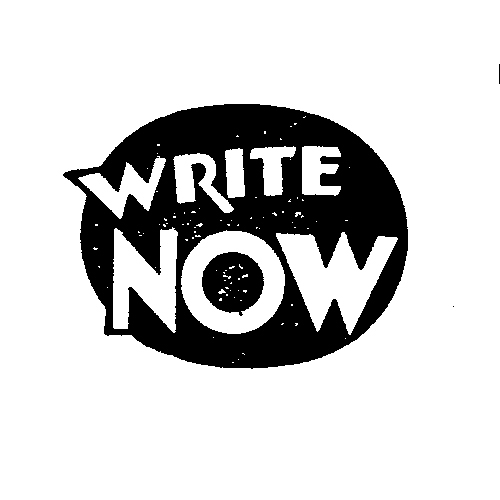 Long term listeners will know that I think writing - articulating your work - is a key skill for designer. I don't normally talk about individuals because that inevitably means I miss someone out (see last post). But there have been four posts in the last week by members of the design team and I think they are worth sharing. First up, on the Inside GOV.UK blog Amy has written about how we're changing the Support section of GOV.UK. Henry talks about "browse" pages and some of the designs we're starting to test to make those pages better. On the GDS blog Josh as brilliantly sums up a few talks he's given recently about accessibilty. The presentations are up there too. Essential reading. 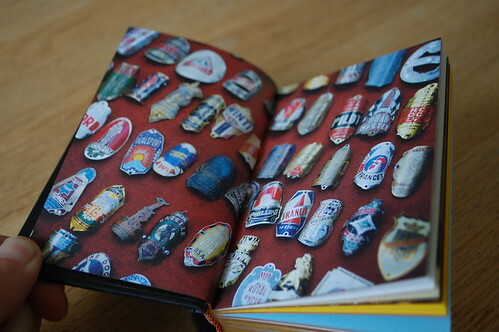 And on the 100 Archive Stephen has written about "doing the hard work to make it simple" but it's much more than that, it's a lovely insight into a design career. 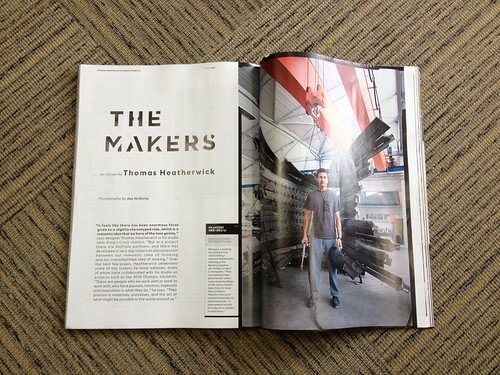 Good interview with Heatherwick in this months Wired magazine. But by far the best bit is in the Editor's letter. "Heatherwick was adamant we should champion the behind-the-scenes experts who turn such ideas into physical reality. So he selected eight makers for us to profile - the people, from welders to panel-beaters, who define "the art of what might be possible in the world around us"." As I said yesterday, you can not design alone anymore. The era of a lone genius working in a garret is over and design writers should stop perpetuating that myth. Good design does not get made that way. 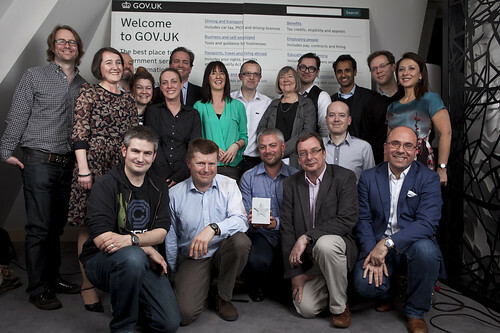 That's why when we went to the Design of the Year awards evening earlier in the year we took a broad section of people from across government and across GDS. In this picture below there are people from MoD, The Foreign Office, Ministry of Justice and the Cabinet Office. There are designers, developers, writers, product managers, project managers, operations people, policy people and others. And there were many, many more we could have taken. There's a series of articles on Fast Company at the moment about Apple and Design. 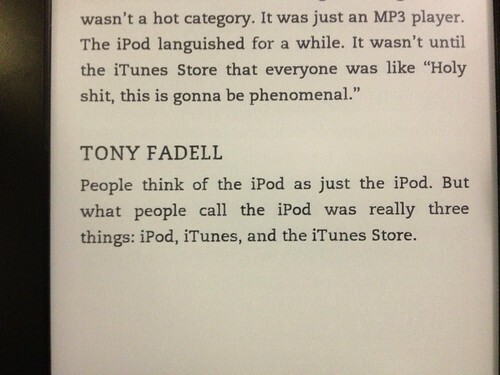 It's called an Oral History of Apple and they've interviewed ex-Apple employees and then just put that togeteher as a series of quotes. There's no Fast Co commentary and it's all the better for that. Sadly trying to read the articles online is near impossible because of all the annoying whizzy Fast Companynesss. It's hard enough just to find where the series begins. 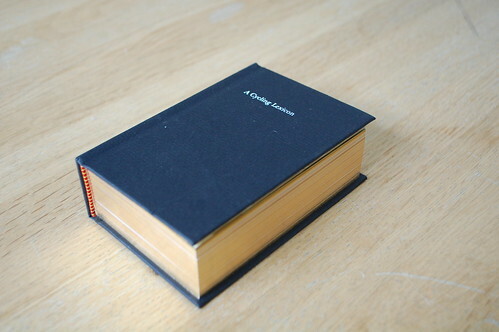 So I bought it as a Kindle Single, much better and easier to read. Anyway. The series is about "how Apple used design to rise from near bankruptcy to become the most valuable company in the world". 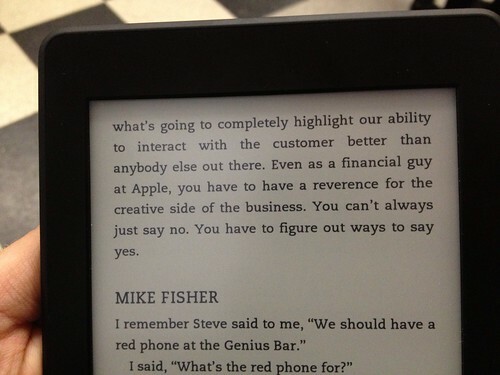 You see articles like this written about Apple all the time and it really annoys me. Yes, Apple are very good at design. Staggeringly, consistently, good. But they are not just good at design, which is what these articles always seem to imply. Apple have not gone from "near bankruptcy to become the most valuable company in the world" just because of design. That success cannot be down to design alone. To even suggest that is crazy. You can't get to be the most valuable company in the world by being good at only one aspect of your business. I know nothing about Apple but I assume they are very good at procurement, at HR, at negotiating and so on. In fact, reading between the lines, the Fast Co article seems to suggest that. You can't design alone. The era of a lone genius working in a garret is over and design writers should stop perpetuating that myth.